Are you tired of licking your gps suction cup mount to stick it to the windshield or re-positioning your aftermarket beanbag mount that’s sliding around you dash-board? Your other option was to use an air conditioner clip that now blocks your cool air flow. Now let’s look at the option of the push button directions offered by an american manufacturer, when they ask you to pull over to get directions with a monthly fee that will break the bank and still frustrate you since you have to write the directions down…! 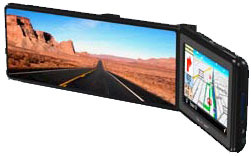 We have the most convenient solution with our new clip-on 4.3” Hi-resolution rear view mirror mount navigation system with navteq mapping and lightening fast win ce 5.0 Operating system, and the latest sirf star-3 chip solution. Don’t forget 12 million points of interest. This puts your map viewing at a more convenient position. Now add other features like back-up camera input, mp-3 playback via a2dp for pda’s, or use the onboard sd card reader (reads cards to 16gig.) For your pre-recorded media. Now all you have to is dial your fm receiver to on board fm transmitter frequencies (88.3 ~ 89.1) To listen your favorite source material. Now that’s what we call a solution to media integration!